Orange Beach waterfront condo for sale at Bayshore Towers. Stunning resort property with lots of upgrades! New refrigerator, new air conditioner, upgraded carpet, tile, and beautiful wood flooring. This waterfront home has stainless steel appliances and granite counter-tops in the kitchen. This residence also has an additional room which can be used as an office, sewing room, study or media room. Grill your fish on the private balcony while you take in the views of the Bay, looking through Perdido Pass Bridge, all the way to the Gulf of Mexico – no need to board a Dolphin Boat to watch the dolphins play! This 9th level condo looks over the Back Bay building also, providing endless views. Bayshore Towers has a large marina with boat slips for sale periodically and the community is dog friendly – Owners can have up to 3 dogs! The complex has a large grassy area for picnics on the north side. 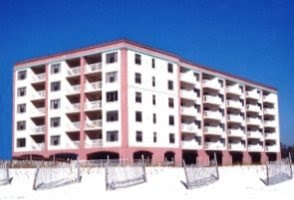 Bayshore Towers resort condos are in Orange Beach at Bear Point on Wolf Bay. This waterfront community has extensive grounds with exceptional landscaping. This bay-front complex is ideal for fishing, skiing and boating – access to the Gulf of Mexico is only 10 minutes away via Perdido Pass.